As a therapist, I help clients learn how to silence their inner critics, to climb out of the pit of depression, to develop coping skills to manage panic attacks. And I truly do​ ​meet clients with unconditional positive regard — I accept them for who and where they are, no matter what their symptoms, struggles, or failures. But the quote above reminds me that growth is not just about triumphing over obstacles. It also means embracing our faults and flaws with real acceptance. Not just accepting our shortcomings until​ we can transform them into something “better,” but to see our faults as intrinsically perfect parts of us. My own anxiety and depression are not states that I must see as adversaries. They also bring with them the gifts of sensitivity, compassion and empathy. My 50-year-old body is not to be celebrated in spite of my arthritic knees and crepey neck and stretch marks. My body, as are all bodies, is a miracle that includes those hallmarks. We can learn much from the ways we fall short, and not just how to “do it better next time.” We can learn that fear can be welcomed without resistance. That at the core of anger is a capacity for burning passion. That our sadness and weakness house the warm comfort of our softness. Certainly, if symptoms or circumstances are keeping us from living authentically or functioning as we wish to, working through them or past them is an appropriate goal. 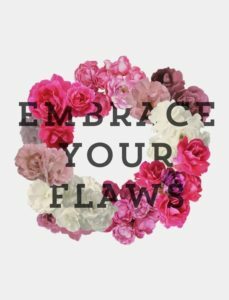 But we may learn just as much, if not more, by inviting our flaws into the light, encircling them with a welcome embrace, and accepting their legitimacy and their lessons in our lives and ourselves.